There’s no question that Nashville’s burger game is strong. Heck, even Thrillist’s National Burger Critic Kevin Alexander came through town on a greasy tour of some of our best patties and did a pretty darned good job at identifying some of the top spots (for a carpetbagger). 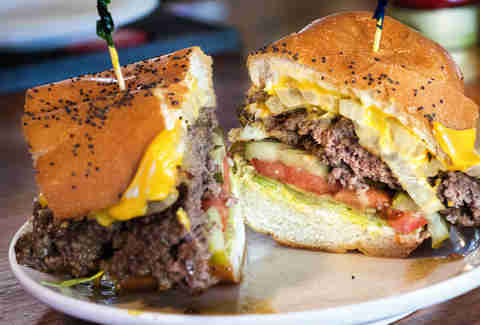 But listen to a local if you want to find Nashville’s most iconic and delicious burgers. Here’s where to get your fix in the Music City. Rotier’s is largely famous for its French bread burger, which is essentially a regular burger on French bread instead of a traditional bun. There’s just something about the quirky bread swap that had made this dish exciting for decades. It’s probably due to the complementary side of surliness, the routine jokes and insults that fly between servers and patron. Remember, it’s all a ruse, so be nice and tip well. The rumor is that the reason Brown’s burgers and fries are so damned good is that they haven’t changed the grease in the fryer or the griddle in years, but that’s not true. They change it religiously -- on Easter and Christmas. For an authentic experience, get the cheeseburger with mayo, lettuce, tomato, onion and pickle, and don’t forget to remove that toothpick holding it all together before you bite down. 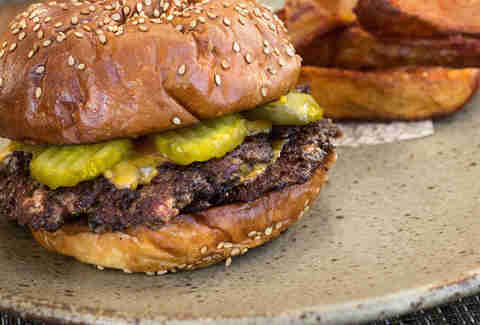 If you want to feel a bit high class while enjoying one of the best burgers in Nashville, then Husk is your spot. 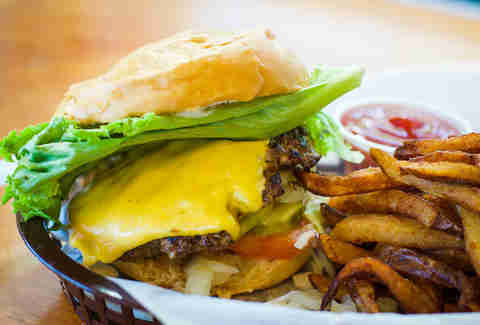 This classic burger is stacked high with double patties of Tennessee-raised beef, onions, and lots of American cheese. Arguably one of Sean Brock’s simplest and best culinary masterpieces, this burger is a tribute to the drive-in diners of his childhood. It’s only served on their lunch and brunch menus, so don’t go expecting a burger for dinner. What -- you haven’t heard of this place yet? Maybe you should get south of Old Hickory Boulevard every now and again, because this little gem is definitely worth the trip to greater Brentioch right before you reach Nolensville. The Greek family behind Southside combines their heritage with traditional American food to create a unique cuisine, including this outrageous burger served with Gouda, truffle oil, and apple-smoked bacon. 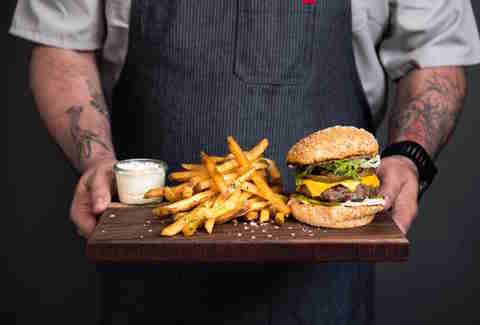 Truthfully, many of the burgers on this list are some sort of knock-off of the iconic Californian In-N-Out Burger, but Gray & Dudley Chef Levon Wallace can claim the Cali heritage to improve on the original with his creation. After extensive study of the proper ratio of ketchup, mayo, and relish in his special sauce, the conscious decision to barely sear the bun on the flat top grill, and the addition of thick-cut onion rings that he describes as “damned near burnt,” Wallace’s masterpiece stands alone. Wait a minute -- how can a biscuit make a burger list? There are few better hangover helpers than a good greasy beef patty, so you shouldn’t care what sort of bread it lies upon when it’s waiting to help you absorb last night’s overindulgence. The Wash Park at Biscuit Love stacks two beef burger patties, pimento cheese, bacon jam, and an egg on top of a perfect biscuit. Thank us later. Fat Mo’s often gets overlooked on these lists, and that’s unfortunate because owner Mo Karimy was grilling up great burgers in Nashville in the early ‘90s, long before the current spate of gourmet beeferies sprouted up with menus of organic grass-fed patties topped with cheese from a goat named Petunia on a bun baked using wheat that was milled using an ancient grindstone powered by a team of unicorns. Mo makes huge burgers, and the 27-ounce super deluxe comes topped with American cheese, mustard, mayo, ketchup, pickles, lettuce, tomato, grilled onions and mushrooms, bacon, BBQ sauce, and jalapeños. It’s literally not for the faint of heart. Thanks to the flavorful glaze of sweet chili teriyaki sauce, the veggie version of PM’s char grilled burger is the rare example of a non-meat patty that’s almost as good as the carnivore’s version. (You’ll note we said “almost.”) Served on a kaiser roll with crispy lettuce, onion, and tomato, this is a neighborhood secret that’s worth seeking out. Quite often a contender for the best burger in town, Gabby’s Seamus burger is a classic All-American. It’s the meaty little brother of the double-patty Gabby burger, which is a great option if you’re extra hungry. But stick with Seamus since you’ll need to save room for a side of fries; they’re some of the best in the whole city and are just as delicious as the burger. Apparently unafraid of the corporate lawyers under the golden arches, Union Common’s version of the Mac-Daddy is a pretty luxe take on the fast-food original. Sure, it has the same ingredients as the ancient sing-along “two all-beef patties, special sauce, lettuce, cheese, pickles, onions on a sesame seed bun,” but Mickey D’s never served its burger with a side of duck-fat fries. Advantage: Union Common. 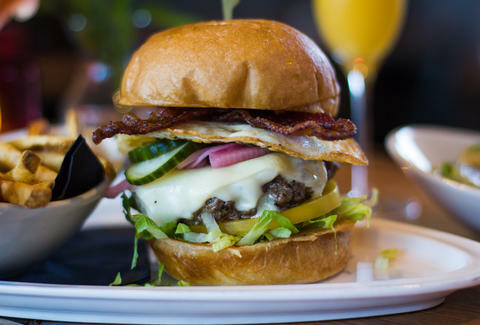 Widely popular for their weekend brunch menu, Tavern has one of our favorite burgers in Nashville right now. 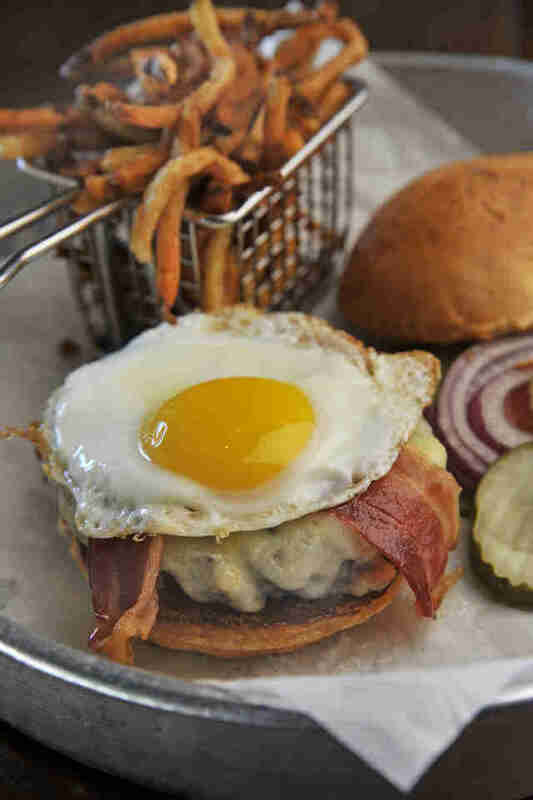 And luckily for us all, the Tavern Burger can be ordered for brunch, lunch, and dinner. (And if you went for all three, we wouldn’t judge you.) This beef ribeye and filet burger is stacked on top of a melt-away bun with all of the traditional toppings and your choice of cheese, bacon, griddled onion, and a fried egg. The 96 burger from Burger Republic was the highest-scoring burger (with a score of 96) in the 2014 World Food Championship. So, we thought that it deserved a spot on this list of amazing burgers. The patty might look like your average burger patty, but the beef is actually blended with blue cheese and then topped with honey balsamic-glazed mushrooms, onion, and (of course) a good bit of bacon. Sounds like a winner to us. In case you simply can’t decide between a burger and a BBQ sandwich, Martin’s brisket burger marries both American traditions, resulting in one meal that packs a ridiculous amount of flavor. 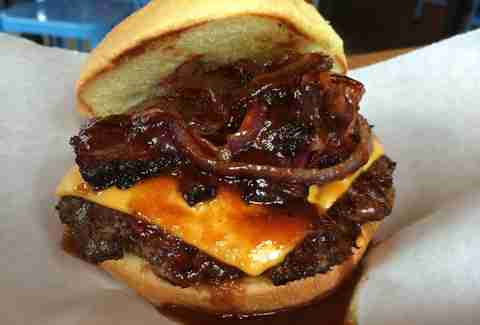 The brisket burger starts out like a traditional burger: beef patty topped with grilled onion and American cheese that’s then topped with slow-smoked beef brisket and a delicious BBQ sauce. If you’re looking for a burger menu with lots of variety, M.L. Rose is perfect. Their long list of ranges from plain cheeseburgers to turkey burgers to our favorite: the Nash Vegas burger. Served on a sweet potato bun and topped with pimento cheese, crispy tobacco onions, and barbecue sauce, it’s a unique take on the American classic. Brita Britnell is a Nashville-based food photographer and writer who eats a little too much and plays roller derby to burn it off. Follow her at @BBritnell. Chris Chamberlain is a Nashville born and raised food, drink and travel writer who is a pretty accomplished cook in his own right. But even he has trouble cooking a decent medium-well burger over an open fire, so you can often find him at one of these places leaving it to the professionals. Follow the burger-meister on Twitter @CeeElCee.